The potato chip industry in the Northwest in 2007 was competitively structured and in long-run competitive equilibrium; firms were earning a normal rate of return and were competing in a monopolistically competitive market structure. In 2008, two smart lawyers quietly bought up all the firms and began operations as a monopoly called "Wonks." Monopoly is where one firm is the sole supplier or controls a large part of the market share. Monopolistic competition is a form of market structure where many competing firms sell products that are differentiated from each other. a) As a result of this transition from monopolistic market to monopoly, the stakeholders i.e., the businesses, government and consumers have been benefitted. b) The equilibrium price and output (for both monopoly and monopolistic firm) is determined at a point where the marginal revenue curve intersects the marginal cost curve. The equilibrium price will be lower in the monopolistic competition as a result of a flatter demand curve and output will be greater. In monopoly market price will be higher while output will be lower. In the above figure demand curve is a downward sloping steeper curve and its corresponding marginal revenue curve is lying below the demand curve. Equilibrium takes place at a point where marginal cost curve intersects the marginal revenue curve from below. The Equilibrium price and output are Pm and Qm respectively. 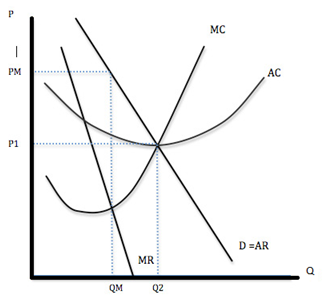 The rectangle above the AC curve shows the economic profit of the monopolist. The above figure shows the price- output determination under monopolist competition. The equilibrium takes place where MC cuts MR from below. The equilibrium price and output are Ps and Qs respectively. 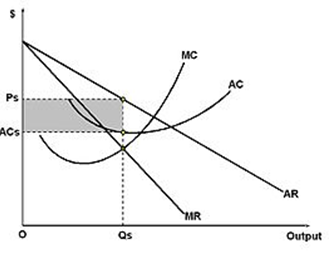 The economic profit of the monopolist is shown by the rectangle above the AC curve. It can be seen from the above figure that the monopolistic demand curve is relatively more elastic than the monopoly demand curve. The price charged by monopoly firm is higher than that charged by monopolist firm and the former's output is lower than the latter. Thus, monopoly firm makes higher economic profit than the monopolistic firm. There will be no fear of external competition or threat of entry. They will earn huge super normal profits. They can charge whatever price they want and exploit the consumers. They can spend resources on research and development. There is no need to incur expenditures on advertisement. They can extract the maximum consumer surplus. They do not have any pressure to operate efficiently. This is not the same market structure that will benefit the consumers. The market structure which will benefit the consumers the most is perfect competition market. - Under monopoly market deadweight loss from the market power is the maximum while it is small in monopolistic competition and zero in case of perfect competition. - The price charged under perfect competitive market structure is lower than that of the monopolistic and monopoly market structures. The output offered for sale is more in perfect competition market than the monopolistic and monopoly market structures. Thus, it is considered to be a better form of market structure. - The inefficiency in monopoly market is maximum when compared with perfect competition and monopoly. - There is no price discrimination in perfect competition market which is a key feature of monopoly. Perfect competition leads to maximization of social welfare as there exists efficient allocation of resources whereas in monopoly resources are misallocated causing a loss of social welfare. However, in reality perfect competition rarely exists. Under such circumstances it can be stated that monopolistic competition is the best form of market which will be beneficial for the consumers. A key feature of monopolistic competition is product differentiation. Various brands with product differentiation and variation provide a wider scope of choices to the buyers. This leads to enhancement of consumer welfare. Market power is of a smaller degree. Excess capacity tends to be small. Price is lower and output higher than the monopoly market.